← Will Burger King save our diet? English pie in our Wilmo!!!!! And because is friday… i present you our “local office pub”: The Wilmington… for us just Wilmo! 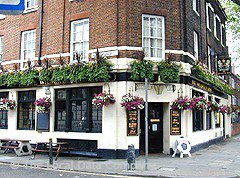 This is a quite big pub with lots of space inside and also if is always packed, we like it because it’s very cosy and all the people working there are very nice. So, on top of the fact that it’s the place were we use to have parties, weekly drinks, leaving dues and all the rest, with the time someone discovered it’s also a very nice place to have lunch…especially on friday. In the menu there are the classic burgers, soups and english pub dishes, but what makes the place so famous in our office are its amazing English Pies! I have to admit i never had one before just because i can’t stand the meat inside these pies…they seems so heavy and strong taste that i was never interested in trying them, but here everyone was speaking so much about these pies that i had to give a try… just delicious! My happiness was to find there a vegetarian pie too, with goat cheese and sweet potatoes… it’s the best! I than tried a bit of the porky one, that was good too, but nothing to do with the VEG one. The combination of sweet potatoes and cheese is just perfect and the pastry of the pies is fabulous, not heavy, not salty or hard… it was just right. I don’t know if you have never tried and english pie, but if you come to England i suggest you to go for these, avoiding the well known fish and chips or baked potatoes! It’s worth it and for lunch, it’s just perfect! PS. Mamy queste te le devo far provare la prossima volta che venite. Invece delle solite patate che ci prendevamo, vi porto in quest’altro pub per farvi assaggiare le english pies, delle tipiche tortine rustiche inglesi. Invece di riempirle con uova, verdure e formaggio, qui le fanno con la carne e nei modi piu’ strani. Dal maiale con i pezzettini di mele, alla carne di manzo con le cipolle carammellate o con il pollo. A me quelle con la carne non fanno impazzire, ma questa vegetariana che ho provato era buonissima: formaggio di capra e patate dolci ( che pensa a me solitamente non piacciono) ed era un accostamento fantastico. E poi la pasta della tortina e’ meravigliosa. Viene fame solo a vederle in foto! This entry was posted in Eating out and tagged chips, mash, pie, pork, vegetarian. Bookmark the permalink. Ahh, delicious English pies. I’m English and haven’t been home for nearly 12 months, thanks for reminding me what to go home for!